Icey Tek are known as the makers of some of the best and most effective coolers on the market. The problem is, however, that they are few and far between and very very hard to actually rack down once you’ve decided you want one! So, what we’ve done is find some of the best ice coolers out there that have very similar - if not the same - features and cooling power as the infamous Icey Teks. There are a few different products listed below that are suited to a couple of different purposes so you should be able to find something that works for you. Please note these are not actually Icey Tek coolers themselves, but very similar to this grand brand. We chose this 40 quart (around 40 litres, roughly speaking) Grizzly cooler because it offers a balance of durability and cooling power. It is not the most rugged or the best cool-retaining product on the page, but definitely has the best balance of features. It’s a USA manufactureed, solid medium capacity cooler. It features rubber feet for stability - a good feature when you’re out camping or fishing and need to rest the cooler on slippy surfaces. There is a 2 inch drain - which is a relatively generous size - which means you won’t have to be lifting quarts and quarts of water weight when you come to empty it. To back up the rugged build, there is a rubber basket integrated in to the lid so that if the worst does happen - and it comes flying off the back of the pick-up - you’re not going to see floods of liquid coming out the seals! All in this is a great all round cooler that carries some of the Icey Tek benefits and a lower price. You can check it out over on Amazon who had very good stock levels at the time of writing. This has got to be the coolest cooler we have ever come across; both in terms of features/reputation and how damn good it is a keeping stuff cool. 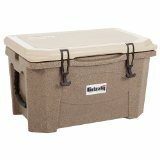 This Pelican 45 quart elite cooler is rated to retain ice for TEN DAYS. Yes, you read that right. You can put ice in this thing and it will still be ice after 10 days (assuming you don’t leave the lid open). It has a freezer grade gasket with a 2 inch insulation buffer. You can see from the picture that this beast is built to last, and Pelican will guarantee this product for life - that has to say something about how confident they are, right? Finally, a note on the bear proofing. It’s important to remember that the idea of bear proofing isn’t to keep your stuff from being eaten, but it’s to discourage bears from being rewarded by getting your food. If they’re able to scare you off and reap the rewards of a well stuffed cooler then they will be encouraged to do it again and again and increase the risk of human and bear encounters going bad. If you are likely to be around bear countries, it is worth spending a little extra and getting a cooler that is certified bear proof (read up over here) as you’ll be protecting those that come after you! The final cooler in our Icey Tek cooler-a-like round up is probably the most rugged and durable offering. 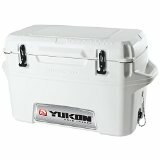 The Yukon Cold Locker is one of the larger coolers listed here, but still weighing in on the mid-range capacity around 50 quarts (remember there are some wheeled coolers that run up to 100 quarts). Like the Pelican model above this is a very robust bit of a kit. It is made of ultra durable plastic and everything about it feels sturdy. This Cold Locker is definitely designed for fishing in mind, too. It has more textured surfaces than some of the other models here, meaning you can clean and prep your big catch on the box itself, weight it using the integrated scales and then keep it guaranteed cold. Igloo have some integrated technology with this cooler which helps to boost cooling by minimising surface contact meaning that more of the cold air will be kept insulated inside. On that note, this has a 3 inch insulation in the gasketed lid (where you’re most likely to bleed heat from) and a 2 inch insulated wall through out making it VERY effective at staying cool. It’s been designed for rugged use so will be the perfect companion for any fishing, camping or hunting trip!